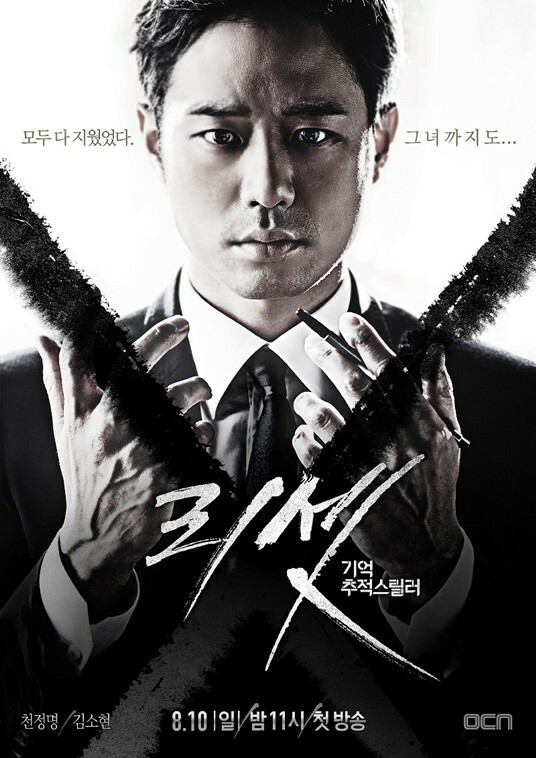 Cha Woo-Jin (Chun Jung-Myung) is a prosecutor. 15 years ago, he lost his first love Seung-Hee (Kim So-Hyun) to a crime. Since then, he has devoted himself to violent crime cases. While he looks for a criminal, a female high school student Jo Eun-Bi (Kim So-Hyun), becomes involved in the case. Section Chief Han (Shin Eun-Jung) and a prosecution investigation officer (Park Won-Sang) works with Cha Woo-Jin. "Reset" takes over the OCN Sundays 23:00 time slot previously occupied by "God's Quiz Season 4” and followed by "Dr. Frost" on November 23, 2014. Early working titles for the drama series were "Crying Game" and "Ten Days Ago". JamJam Sep 13 2018 7:00 pm The plot is good and not so boring actually. But what I hated the most in this series is the main lead. For a prosecutor, he is pathetic, weak and stupid! He cannot do anything on his own. Without the help of the Investigator and Chief or even Eun Bi to save him everytime he is captured, he could've been killed already within the first 3 episodes of the series. I just managed to finish it coz i always do finish what I've started. But really, the main lead is frustrating! H Jun 25 2018 5:41 pm Don't hate it, don't love it. I thought the whole X factor was interesting, but wow it got really complicated and confusing especially after the reveal. I had to keep reminding myself how all the killings are connected to one organization and frankly, I still don't think I understood everything lol. The hypnosis part was pretty good tho. Shinma Jun 20 2018 2:01 am Waste of time. Difficult to accept since the primary character "Cha Woo-Jin" is unbelievably pathetic and a hypocrite. Arihant Sep 19 2017 6:41 am This is from the writer of Yong Pal and The K2,two of my fave kdramas(yes,i like heroic action dramas with happy endings). Didn't hear great things but just had to watch it. This one is a mindbender for sure. You will be as confused as the actors while the mystery unfolds and the show kept me hooked. However, once you know the main bad guy, becomes slightly generic. I came across CJM from this and found him well cast. Have now found his older dramas and understand why he is a big name in Korea. Kim so Hyun also is great in the twin roles. The romance was kept on the down low, presumably due to the age difference. Mikan Aug 05 2017 6:30 am Stupid story. Mask of the Past Dec 23 2015 5:39 am so much criticism for others. but such a great one for me. before saying that it's too boring for you to watch, then why don't you write your own story and make it into reality? let's see if i'll be a hit or just a so-so :3 lol. Kim Na Na Oct 04 2015 7:14 am I can't watch this drama anymore. Stopped already. It was so boring. firenze Sep 26 2015 8:36 pm OMG! This drama is so ironic in all sense. Conflicts, climax after climax and thrill were built on stupidity, carelessness and non-sense acts and decisions. I can not believe that an able and intelligent prosecutor keeps repeating the same mistakes and stupidity, his character was so inconsistent with the way the writer is trying to project him. The group of house of peace was almost great until the scene of the execution of the chairman at the prison cell, another mistake of the writer was to inject sentiments and emotions, after having sacrificed so many lives, at the end they gave in to the chairman without even assurance of safety. And the most stupid and incompetent character was detective Go, presented as a brave and capable man but in fact a no brain and weakling detective who can not protect his subjects at all and even his years in service did not help him to be wise at all. Could have been a great detective, action, suspense thrilling drama story had the writer and director done a bit of research and study. guksram Jul 30 2015 10:42 pm one of the worst ocn dramas. for the discerning audience, learn from those who made the mistake, unless you would rather waste ten plus hours watching trash. Renee May 20 2015 7:40 am Kim So-Hyun played another double identity in a drama, just like here present one. Now that I've seen the trailer, this actually looks good. Keeping aside that So-Hyun is one of the cast, I want to see what will happen here! danniah May 03 2015 12:46 am @lila that's rite. I finished this drama last week too. I agree that it's worth to watch but yet can't let myself expect this to be outstanding. So-so. lila May 03 2015 12:09 am I didn't want to watch this drama at first actually because this drama doesn't have much positive feedback from viewers, but yeah, I gave it a go. After I watch it, the drama is not that bad actually, typical OCN's drama. It has so many twist but everything is related to another thing. This drama is so intense from the start and doesn't give you time to relax, that's why some viewers feel boring and find it hard to continue watching. Its ending is good enough. They open all secrets at the end but still left some issues unfinished. If you only want mere good ending, you can watch this drama. But, if you want a perfect one, hmm you will get upset. Lira Nov 01 2014 6:50 am kim so-Hyun! u really amazing in this drama! like it! CaliforniaDream Oct 31 2014 8:07 pm This K-Drama has too many twists / turns and is very difficult to follow. I'm going to stop watching. After every episode I'm just getting more confused, so I'm done. kddramatic Oct 27 2014 1:48 pm love this kdrama sooo much its soo interesting!!!!! can anyone please tell me the OST of it!!!! Bel Sep 15 2014 7:07 pm I really like this drama. I can't wait to watch the next episode. Please upload quickly.... :)))) Thanks. SHINE Sep 03 2014 1:43 am What will happen now..
Andrea Jul 11 2014 2:59 am @michael: Based on the plot... Seung Hee (So Hyun) is Woo Jin (Jung Myung) 's first love 15 years ago. We don't know yet whether Jung Myung will play the teenage part of Woo Jin, too or not. Not likely. While in the present day Eun Bi (another teenager also played by So Hyun) becomes involved with a case that Woo Jin's working on. And I don't think there'll be any romance relationship there. So there's nothing weird as So Hyun only potrayed Jung Myung's first love 15 years ago. michael Jul 08 2014 10:14 pm Does that mean So Hyun will be playing Jung Myung's lover? ... isn't that abit weird?